Oh, Ginny. Why? Why must you tear the twine that’s holding those panels together, right before my eyes? You looked oh so satisfied with it ripped in two, with all your very deliberate tugging. I’m really glad that we used about ten times more than we needed. Too bad the fence didn’t move when you tested it! We seem to have figured out a water bucket that you can’t flip over and destroy. I think you two are really jealous of the new pup, because Bjarki doesn’t come play with you anymore. You have a whole flock of chickens to hang out with, though! They all seem to love the pig palace better than any other shed. Oh, pups! You make me laugh all day long. Watching the two of you is way better than any television I’ve ever seen. 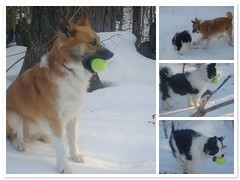 You are so alike in so many ways, with the tennis ball obsession and the love of snow. Deeza, you are so much more vocal, though. What a little a drama queen, and thanks so much for always telling me all about how you feel, about everything, with gusto! Oh, breakfast. How yummy you were today, and how proud I was of making you. Our yummy eggs from the hens, who are finally laying again, still with that bright orange yolk. Purple potatoes from the garden, that I’m almost out of, sadly. Our bacon, from the poor piggies that went off to freezer camp last fall. Homemade bread, that is holding up well. 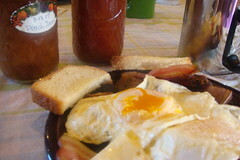 Peach jam that I canned this summer, and catsup that I canned from our tomatoes. It doesn’t get more homesteady than this. Plus, yum! This entry was posted in Dogs, Farm Life, Food, Pigs. Bookmark the permalink. Post a comment or leave a trackback: Trackback URL. Wow… that breakfast looks and sounds devine! I can’t believe you made your own catsup. WOW. This actually made me hungry.